The lodge invites the incredible beauty of the African bush in – expanses of windows and doors mean that you have nature right around you as you sit in the comfort and luxury of the superbly appointed bar lounge. A spreading deck surrounding the main lodge affords you breathtaking views of the lake and the gorge upon which the lodge perches – watch pelican sweep the skies as you take sundowners, see the sun slip like a segment of orange into the hills and listen to the sounds of Africa nestle up to you as night slides in. Escarpment Luxury Lodge boast 16 excellently appointed and private chalets offering double, singles and triples. Each chalet has its own private deck from which you can view the lake below you and watch wildlife as it drifts through the lodge grounds. Abundant bird life fills the trees and bushes which grow right up to your deck – affording you the sense of being immediate with the natural bush of Africa whilst luxuriating in your private chalet. Wooden floors and wide windows and doors add to the natural feel of the lodge and every effort has been made to ensure comfort and luxury: large beds with sumptuous linen, leather sofas in your own small lounge area, handmade and recycled finishes in keeping with our intention to encourage an eco-friendly environment and a large, deep bath from which you can survey the bush and the lake. Wake in the mornings to the gentle sound of a wooden cow-bell, straight from the neck of a Masaai cow, take your tea or indeed any meal on your deck and enjoy sundowners as you watch the sun set and the gorges and hills surrounding the area grow dark against the sunset. Artifacts used in Masaai culture complete the look of your chalet where you are afforded the luxury of chandeliers and soft linens and leather sofas as well as the ethnicity of local goods. Each chalet boasts both an inside and outside shower – imagine the glory of taking a shower under African stars as you listen to the night sounds of the bush around you – or early morning outdoor showers to the rising sun and the sound of birds waking. Escarpment Luxury Lodge has taken every care to provide attention to detail and to meet your needs for comfort and luxury whilst enjoying the immediacy of the African bush right at your window or doorstep. In your private chalet you will truly…escape the world. Venturing out from the idyll of Escarpment Luxury Lodge you will find any number of activities available to you. The more physical of you can walk the grounds of the lodge and view the gorge upon which it is set – alternatively, walking safaris in Lake Manyara National Park, Tarangire National Park and the Serengeti can be booked. It can be arranged that you climb the Great Rift Valley Gorge or balloon across the Serengeti or enjoy morning game viewing en route to the Ngorongoro Crater Conservation area via the Olduvai Archaeological site with your packed lunch. • Game drive in Ngorongoro Crater floor were the guests leave the lodge with park breakfast and come back for late lunch or the guests have early breakfast at the lodge and take a picnic lunch for full day Game drive in the crater floor. It takes 1 hour to get to Ngorongoro Conservation Area. • Cultural Activities: Visit the nearby village of Mto wa Mbu for cultural excursions arranged with the local Cultural tourism project. Experience indigenous life with cultural activities such as art making, dance performances, local cuisines and irrigation farming. It can be arranged that you cycle through the farms and surrounding areas of this village. You can visit a local Maasai village visit close to the lodge where you can immerse yourself in the timeless daily activities followed by these pastoralists. Located within a long, narrow corridor formed by the looming cliffs of the Great Rift Valley escarpment and the shores of a stunning lake, The Park offers enormous topographical variety and abundant wildlife for its relatively manageable range of 330 square kilometres, making it ideal for a day trip. Lake Manyara National Park is a particularly memorable place to visit. On the plains, one can see giraffe, wildebeest, zebra, ostrich, elephant, bushbuck, aardvarks and the occasional leopard, while the lake attracts over 380 species of birds such as flamingos, pelicans, storks, cormorants, Egyptian geese, and spur-winged geese. In contrast to the wide-open grasslands of the park centre the ground water forests of tamarind, mahogany, and fig in the north teem with monkeys while elephants can often be seen on the slope of the escarpment amongst the baobab trees. In the acacia woodland, lions can be seen lazily sprawled out on the stout branches of the umbrella trees, while enormous hippos cool themselves in the pools along the lake shore. Escarpment Luxury Lodge nestles along a rift wall at high altitude, offering a magnificent view of the lake. Visit the nearby village of Mto wa Mbu for cultural excursions arranged with the local Cultural tourism project. Experience indigenous life with cultural activities such as art making, dance performances, local cuisines and irrigation farming. It can be arranged that you cycle through the farms and surrounding areas of this village. You can visit a local Maasai village visit close to the lodge where you can immerse yourself in the timeless daily activities followed by these pastoralists. The city of Arusha is a 2 hour drive away from our lodge and can be visited as a day trip – or en route back to KIA from where you will be flying out at the end of your stay in our country. Here you may shop at any one of the local and Crafts shops or galleries for local crafts, artworks, gifts, jewellery, carvings and many other interesting artefacts. Escarpment luxury lodge is a new lodge located on top of the Manyara escarpment just 3 kilometers from the tarmac road next to Lake Manyara Wildlife lodge. 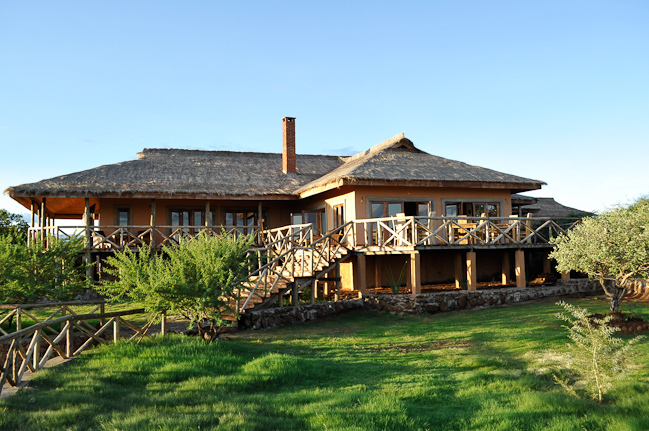 The Main House and Chalets have got the great views of the Lake Manyara national Park.